The Turquoise waters of Turkey have drawn thousands upon thousands of visitors over the past couple of millennia. 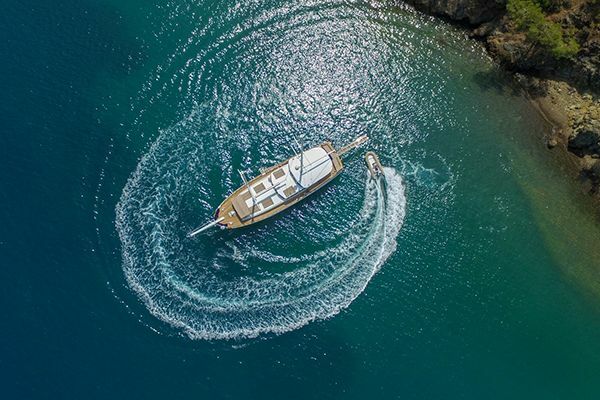 Regardless of its long-standing beauty and popularity, however, the luxury yacht charter scene along the Turkish Riviera is still relatively unknown to many, often overlooked for busy neighbouring yacht hotspots in Monaco, St Tropez and Capri. 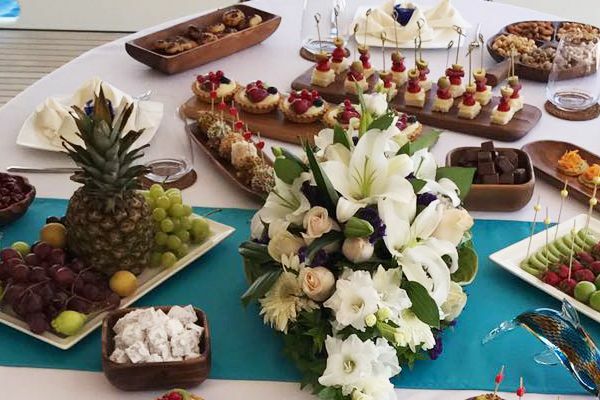 Here we take a look at five reasons why you should charter a yacht in Turkey this summer. The Turkish Riviera enjoys warm waters and very few rainy days from May to October. During the summer months, the prevailing strong northwest Meltemi wind is the norm, making for great days sailing along Turkey’s turquoise coastline. The southeastern coastline of Turkey enjoys crystal clear waters all year round. 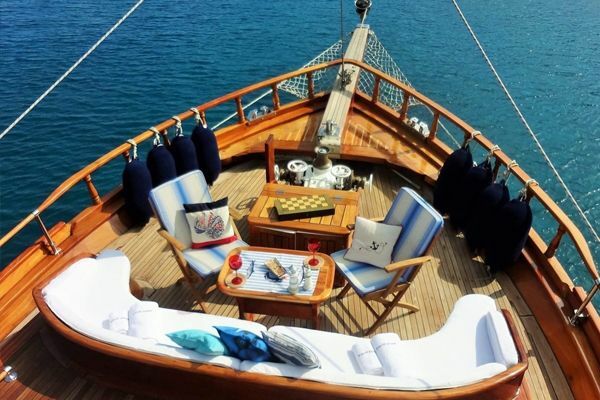 Any luxury gulet charter will see guests explore tranquil gulfs and bays, each more beautiful than the last. Most bays are undeveloped and surrounded by forests, making for the ultimate moments of privacy and relaxation. From the Gulf of Gocek where the ancient town of Antiphellos awaits, to the laid-back fishing village of Kale Koy in Kekova and the stunning bay of Marmaris, the variety of scenery in Turkey is staggering. Not to be missed is the mesmerising sunsets on the Gulf of Hisarönü! For those looking to explore rich ancient history, there is no better place than the eastern Mediterranean. 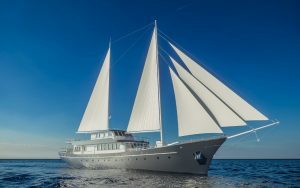 Every charter itinerary in Turkey is saturated with enchanting historical relevance, with most luxury gulet cruises starting in the historic town of Bodrum, built on the foundation of the ancient Greek city of Halicarnassus. In almost every bay, there are traces of the long and significant history of Anatolia. 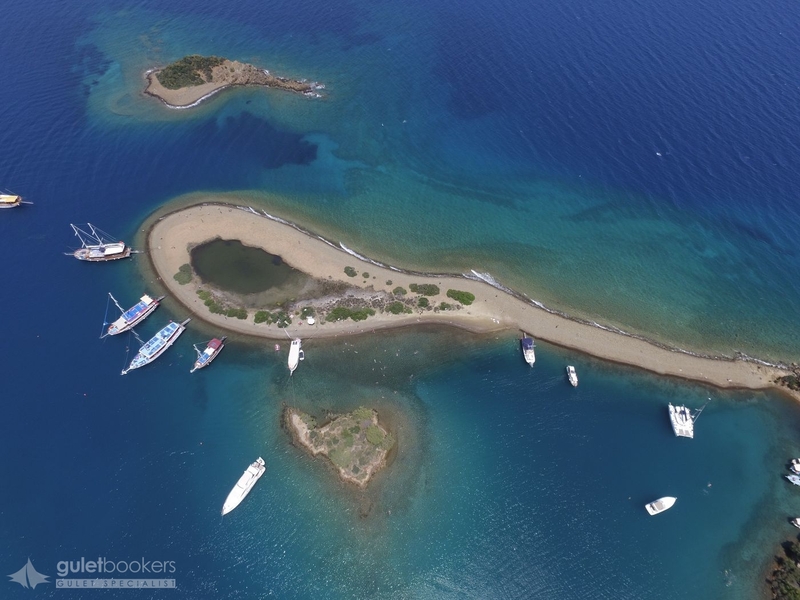 The coastline is littered with historical gems, and ruins which are quite challenging to get to by land are easily accessible by luxury gulet to explore in comfort and style. 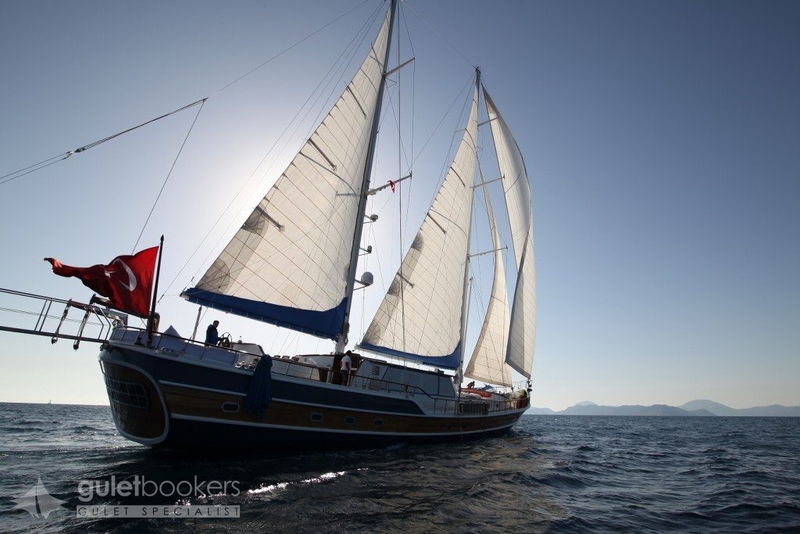 Chartering a traditional Turkish gulet is a unique yacht charter experience. 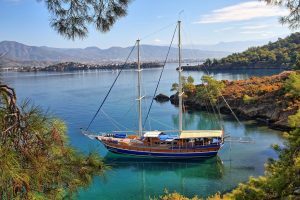 Traditional sailing boats crafted in Turkey, chartering a wooden gulet is a fantastic way to explore the Aegean sea and connect to the local culture and history. Gulet designs date back more than 1000 years, and the wooden construction makes them blissfully cool in the summer, and warmer in the cooler months of the late season. Spacious layouts and can accommodate 6 – 24 people on board, with Guletbookers selection varying from 16 to 40-metres of luxury space. 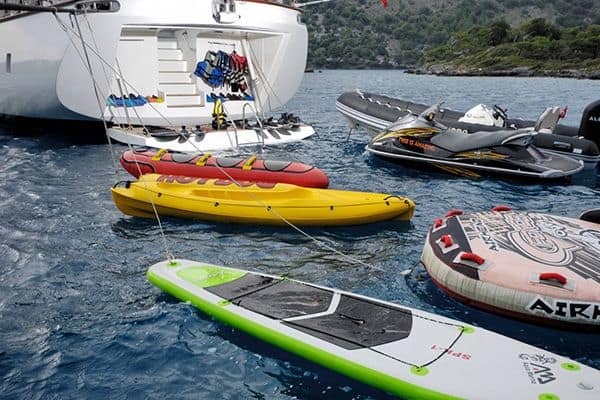 The vast variety of boats available for charter in Turkey and the Turkish Riviera means that, with expert guidance from the TYBA-registered Guletbookers, you will find the ideal luxury gulet for your perfect sailing trip. 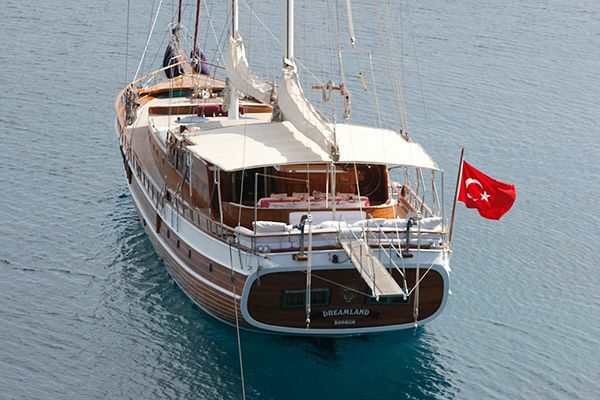 Chartering in Turkey is substantially cheaper than the majority of the Mediterranean. 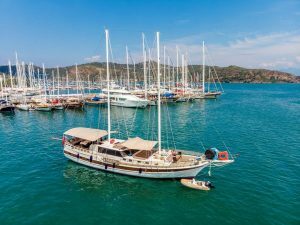 Thanks to the excellent exchange rate for European and American clients, luxury yacht charters in Turkey come at a fraction of the price of a Mediterranean counterpart. Unique gulets come in all shapes and sizes for all budgets, from super luxurious gulets for a sophisticated retreat for eight, to a traditional Turkish gulet designed with large families in mind. The Turkish Southwest coast is easy to reach via four international airports; İzmir, Milas-Bodrum, Dalaman and Antalya. 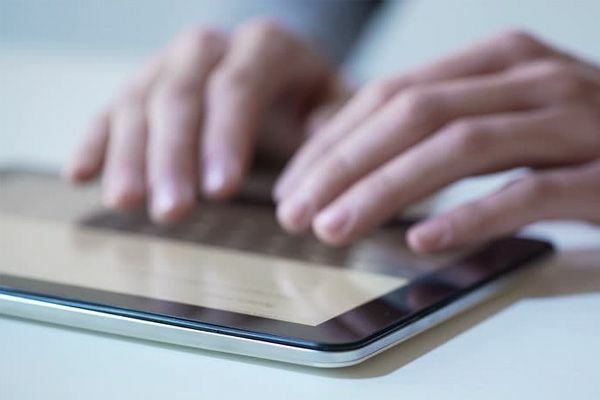 Get in touch with the yacht charter experts at Guletbookers at [email protected] for more information on how to book your dream Turkey yacht charter.